Here is a good omen for the Rhinos: during the modern era, only one other team has advanced on PKs twice. The first was Charleston last year and they made it all the way to the Final where they lost to DC United. Tonight the Rhinos host the Wilmington Hammerheads who find themselves in third place in the USL 2nd Division. They advanced past the Charlotte Eagles (USL-2) in the first round by a score of 2-0. In the second round, they advanced past the Carolina RailHakws (USL-1) after a crazy 3-3 draw and winning 4-3 on PKs. Then they upset the Chicago Fire (MLS) by a 1-0 score to reach the Quarterfinals. The good news for the Rhinos is that Wilmington will be without their starting goalkeeper, Darryl Sattler, who is out with a sports hernia, and veteran defender Tim Karalexis who is out with a hamstring pull. The Rhinos need to watch out for forward Jamie Watson who leads the USL 2nd Division with 18 points and 8 goals in 11 league matches. Midfielder Kenny Bundy is tied for the USL 2nd Division lead with 5 assists. One would hope that the Rhinos offense is on track after exploding for 4 second half goals against Austin on Sunday afternoon. The Rhinos have historically had issues against lower division teams at times, but they've always found a way to advance on. I would expect the same thing to happen tonight. 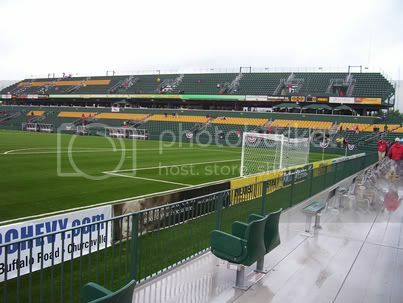 - In case you were worried, Abby Wambach was called up for the USWNT vs Canada here in Rochester in less than two weeks. - SBI.net believes that Oguchi Onyewu signing with AC Milan was the right move. Grant Wahl wonders if he'll get enough playing time in Milan with the World Cup 12 months away. Personally, I was hoping the Ajax rumor would come true as that would give Gooch a much better shot at playing regularly. But, I can understand why he signed with AC Milan. - Ridge Mahoney has a good piece at SI.com on Maurice Edu. - Grant Wahl has the news of Michael Bradley's FIFA imposed suspension for his actions following his red card versus Spain. Thankfully he won't miss the WCQ in Mexico. - It looks like Toronto is ready to use their DP slot on Julian de Guzman. - Bruce Arena is talking tough ahead of Beckham's impending return to the Galaxy. I can't see how this ends well. - Steve Davis at MLSNet.com has a piece about Schelotto's moment of brilliance versus DC. - Where's the part about playing defense for the Montreal Impact?